Our established and continually growing medical practice is hiring an experienced Medical Assistant to support our Doctors, Surgeons and patients. This is a float role to start. Our Doctors are award winning leaders in their specialties both locally and nationally. We are looking for a dedicated, compassionate and self-motivated Medical Assistant to join our team, to be a part of our success, our ongoing growth as well as our commitment to the best possible patient care. We take pride in offering a positive and supportive environment for both our patients and our employees. In this role you will use your skills and experience in both clinical Medical Assistant and Front Desk duties and responsibilities. 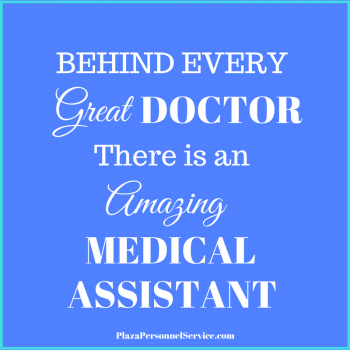 Medical Assistant work experience – 2 or more years of recent work experience as a Medical Assistant in a private practice or clinic. Experience rooming patients, taking vitals, updating charts using EMR as well as setting up and stocking rooms. Experience assisting Doctors with clinical patient care and minor office procedures. Knowledge and experience with medical insurance plans, referrals, insurance verifications and authorizations. Other duties may be assigned by Doctor or Practice Administrator. The rate of pay is $17.00 – 18.00 hr. to start. Do you have a favorite social media site? Plaza Personnel Service is on Facebook, Pinterest, Twitter, Yelp, LinkedIn, YouTube, and Instagram. Check us out on your social media site.